This year I'm really honing in on the basics of writing with my 11th-grade honors ELA students. One challenge I've had in recent years has been getting good introductory paragraphs. This year I decided to introduce a formula that kids could use. I waited until I had graded first drafts of our first essay of the class--an explanatory essay based on a quote from "King Kamehameha III's Feathered Cape" by Richard Kurin. I began by praising three writers whose introductions had been exemplary--being careful to point out two key terms, their "hook" sentence that opened the essay, and their thesis statement. 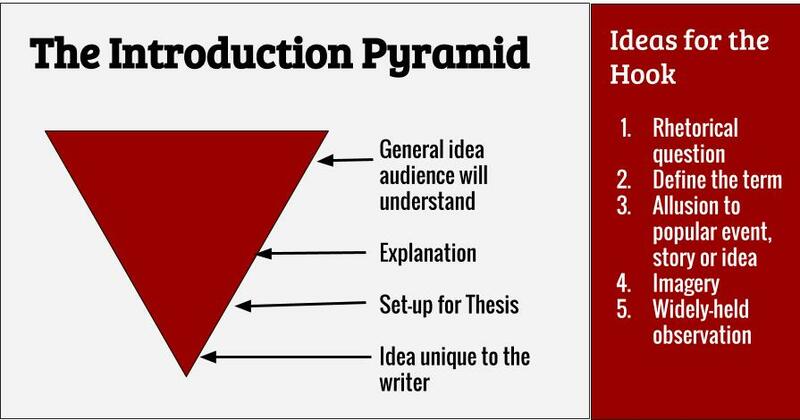 Next, I set up this graphic on the board, pointing out the wide application of the opening sentence, and how the writers used the rest of the paragraph to set up their thesis. Then, I put a sample thesis statement on the board (related to the essay students, themselves, had written). I created "hooks" for the essay based on five, general ideas, and then I showed how I would use 2-3 sentences to connect the hook to the thesis I had written previously. Three students had already created exemplary introductions. 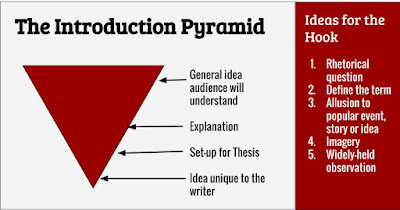 I put their thesis statements on a Google Slide, then I had other students choose one of the thesis statements and create a proper introduction for it--starting with a hook, then connecting it to the original writer's thesis. 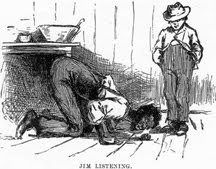 The three exemplary writers then chose a "winner" of the 'guest-introduction contest.' This gave me one more chance to emphasize the hook sentence, and it also reinforced the work of the top writers in the class. As a final task, I asked students to write a new introduction for their essay, and describe what they had learned today about writing the introduction. I was pleased to read that about 40% of the students reported that they would replace their current introduction with the new one developed in class. I'm not much of a "formula" writer. In the past, I have left things vague, leaving windows open for student originality and creativity. 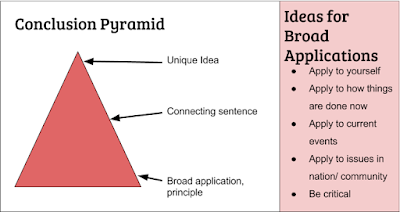 But in an ELA class, providing students with formulae--like this pyramid and, yes, the five-paragraph essay--can provide writers with a foundation from which they can build their case. I would clarify and emphasize that while I 'show' students formulas like the Introduction Pyramid (or the Conclusion Pyramid--which I introduced as we revised the next writing activity), but I don't teach them. It's a tool that many students will find useful, but it's not a requirement for great high school writing.